During last nights game between PSG and Evian there was a big fight in the end of the game where players from both teams came together. In the end Evian had two players who received a red card. See the full fight between the PSG and Evian players here. This entry was posted in Videos on April 29, 2013 by Johan Bengtsson. In the last game against Evian this Sunday Zlatan missed a big chance in front of the goal. Here is the video of it showing how close Zlatan Ibrahimovic’s chance of scoring was and how he put the ball over the bar. This entry was posted in Paris SG, Videos on April 29, 2013 by Johan Bengtsson. Zlatan Ibrahimovic missed a huge chance and Paris Saint-Germain had two players given the red card. But PSG still won the away encounter 1-0 against Evian and the league title is very close to the Paris team. Despite the victory Zlatan Ibrahimovic will hardly be pleased with his ​​performance. In the 62nd minute, he stood for a giant miss. When the score was 1-0 after a goal from Javier Pastore the ball bounced out to Zlatan who was only 2 meters away from the goal and completely free. Zlatan Ibrahimovic however shot the ball high over the bar. Argentine Ezequiel Lavezzi minutes after had a miss in the class with the Swede. After rounding the keeper, he almost scored 2-0 but managed to hit the back of an Evian player. Instead the home team got a chance to tie the game when Italian midfielder Marco Verratti was sent off in the 81st minute. During extra time David Beckham also got a red card, but Evian could not repeat the game from the French Cup when they defeated PSG. Afterwards there was a big fight between players of both teams. Celebration from PSG player infront of the Evian substitutes’ bench sparked the row that had the effect of two red cards were handed out, including to the PSG’s goalkeeper Salvatore Sirigu. 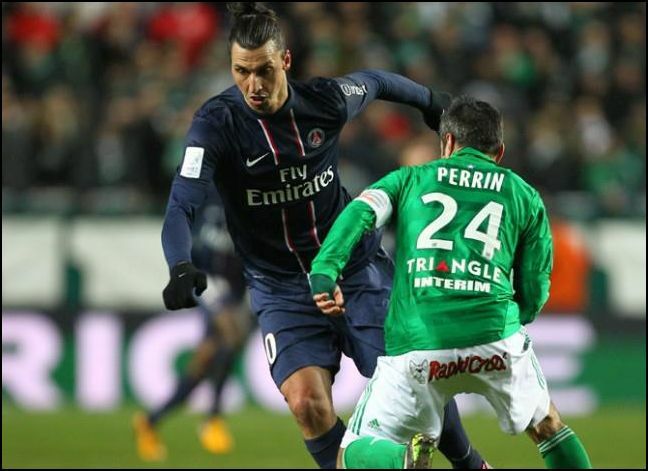 Zlatan Ibrahimovic was not involved in the altercation and defenders Thiago Silva and Alex tried to stop it. PSG now has four games remaining, nine points away to second placed Marseille and also much better goal difference. PSG can now secure the league title next weekend depending on what Marseille does for performance at home against Bastia on Saturday while PSG set against Valenciennes on Sunday. This entry was posted in Paris SG on April 29, 2013 by Johan Bengtsson. Zlatan Ibrahimovic’s comments that he is flattered by Juventus alleged interest in him has been well received by Juventus head coach Antonio Conte. – If Ibrahimovic is honored to see his name linked with Juventus, then it’s a nice compliment from a fantastic player, he told Gazzetta dello Sport. The rumors that have long buzzed about Ibrahimovic has now also begun to act on controversial Liverpool striker Luis Suarez. The recently suspended Uruguayan has been reported to be moving away from the UK. – I think that view (Zlatans view) is shared by many. If you were to talk to Suarez and others, I think they would say the same thing because it is obvious that incredible job we have done here. Even a blind man can see it, says Conte. Juventus have pulled away at the top of Serie A and have gained an eleven points big lead down to second place Napoli. Conte is extremely pleased with what the club has succeeded but expects Juventus will continue to grow as a club. – We have made an incredible journey so far. Maybe we win our second straight championship, but it is inevitable that we must grow. We expect improvements. – The Bayern vs Barca match was a comfort to us but it does nothing to look backward. We’re Juventus and we must always look forward. By comparing ourselves with the Germans, we have received an acknowledgment of where we stand right now. Now we have to get better. Recently rumors about Zlatan Ibrahimovic has been about Juventus, Napoli, Manchester City and Galatasaray. It is however still not confirmed if Zlatan Ibrahimovic actually will leave PSG or if he plans to stay for the full contract. For Zlatan himself he has not been able to reach for a comment on the recent times transfer rumors. This entry was posted in Rumors, Transfer Rumors on April 28, 2013 by Johan Bengtsson. The stars to attend the Eurovision Song Contest in Sweden this year are many. The Eurovision Song Contest will be held in Malmö, 14, 16 and 18 May. But untill now the name of the by far heaviest recruitment has been a secret. It now however seems like SVT (Swedish Television) managed to get Zlatan Ibrahimovic to participate in the broadcasts. He’ll tell a hundred million viewers welcome to his hometown of Malmö and the Eurovision Song Contest. It is said this welcome will be pre-recorded. – It’s about opening the final and is linked to that Bjorn and Benny do with Avicii, said a source within the production. Zlatan’s schedule will not allow him participate live at the finals, he is already commited with Paris Saint Germain on May 18, the day the finals will be held. Even the week before contains matches, on the 11th Zlatan Ibrahimovic and PSG face Lyon in the French league. SVT has previously said that Zlatan Ibrahimovic is high on their wish list for the upcoming giant event. – Zlatan’s the biggest Malmö has said Christer Björkman, show producer then. Christer Björkman know Zlatan’s wife Helena Seger from before and should have talked to her on the sports gala earlier this year. – It is thanks to her that it has now become a reality. So, looks like Zlatan to open Eurovision Song Contest, will you watch it for the music or for Zlatan? This entry was posted in Helena Seger, Rumors on April 28, 2013 by Johan Bengtsson. Marseille continues to foght to be able to take advantage of any mistake from Paris Saint-Germain in the race for the league title. In the evening, they got three new points away against Lorient and put some pressure on Zlatan Ibrahimovics PSG before their match tomorrow. Mathieu Valbuena became the match hero for Marseille this evening when he scored the only goal away against Lorient. While Paris Saint-Germain still have a relatively comfortable lead in the top of the table, the three points won by Marseille might put some pressure on Zlatan Ibrahimovics PSG. Marseille can only hope for mistakes by PSG’s side as they can not win the title by their own. Six points separate the teams in the current situation, but PSG can again extend the lead to nine points away against Evian. If PSG wins the league win is not far away since then only four matches remain. Most likely we will see Zlatan Ibrahimovics PSG bring the league title to Paris this year. This entry was posted in Paris SG on April 28, 2013 by Johan Bengtsson. As we reported yesterday Zlatan Ibrahimovic missed the training due to a disease that prevented him from training. 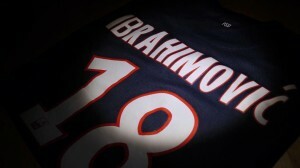 It now seems that Zlatan Ibrahimovic has recovered and might be ready for the match tomorrow against Evian. – He is ready to play the match tomorrow, says PSG’s coach Carlo Ancelotti. Paris Saint-Germain is only four points away from the eagerly awaited league title the club has been waiting for nineteen years. Tomorrow PSG will meet Evian, who recently beat out PSG from the French Cup. – He had a little thing yesterday, but he has recovered and can play the game tomorrow, says Carlo Ancelotti on the press conference the day before the match, which ended up being a lot about Carlo Ancelotti’s future in PSG. This entry was posted in Paris SG on April 27, 2013 by Johan Bengtsson. Rumors have lately been floating around about both Zlatan Ibrahimovic and Carlo Ancelotti. Reports on Friday claimed that Carlo Ancelotti, who has been linked with a move to Real Madrid would leave PSG after the season. These rumors are now denied by Carlo Ancelotti. – I will make a decision when I talked to the club after we have won the title. But we have not talked about this issue yet. There is time. It is not true that I said to the club that I should leave, he said according to Sky Sports. – Media mention Real Madrid and other clubs, but I have not talked to any other club. It is a decision that I and no one else needs to take, and it is not an easy decision. But I am calm, says Ancelotti, who is under contract until 2014. The Italian also denied these rumors to the players on Friday. – I talked to the players yesterday because of all the rumors. It is like I have told them before, that I want to end the league season as the agreement is with the club and we will talk after the season to come to a decision. PSG leads Ligue1 nine points ahead of second placed Marseille. On Sunday evening they have a game against Evian. With only 5 games left a win against Evian would put PSG very close to a league title. It would also mean yet another league that Zlatan Ibrahimovic has won. This entry was posted in Interviews, Paris SG, Rumors and tagged Carlo Ancelotti, transfer rumors, Zlatan Ibrahimovic transfer rumors on April 27, 2013 by Johan Bengtsson. Le Parisien today writes that the PSG coach Carlo Ancelotti leaves the club this summer. While stating that Goal Zlatan Ibrahimovic agent, Mino Raiola, held meetings with Manchester City’s sports director about a move for Zlatan to Manchester City this summer. According to the French newspaper Ancelotti has informed the club president Nasser Al-Khelaifi, during a meeting on Wednesday that he goes to a new club next season. The decision will become official as soon as PSG secured the French league title. As for Ancelotti’s future, he has long been rumored to be Jose Mourinho’s replacement at Real Madrid and a contract with Real Madrid is 90 percent complete. The Italian coach will have already made a wish list of signings for the Spanish club . – We assume that Zlatan is still in Paris next season, but if the situation at PSG change, a relocation become thinkable, that is, if PSG for example, replace the coach. And now it is reported of a renewed interest from a club with another Italian coach, Roberto Mancini. The management at Manchester City are interested in signing the Swede Zlatan to Manchester City in the summer. The only thing stopping it is if they can or not can get Edinson Cavani from Napoli. The club’s sporting director Txiki Begiristain, recently met Mino Raiola to discuss the future of Zlatan Ibrahimovic. Mancini, who worked with Ibrahimovic at Inter, has previously tried to recruit Zlatan to Manchester City. These latest rumors adds on to all the potential clubs that have been mentioned as potential clubs for Zlatan Ibrahimovic. Recently it has been Juventus, Napoli, Manchester City and Galatasaray for Zlatan Ibrahimovic. This entry was posted in Interviews, Rumors, Transfer Rumors on April 26, 2013 by Johan Bengtsson.